To start receiving offers for Honda parts, please fill in the following information fields. Honda Motor Company has manufactured a variety of vehicles and equipment over its 70-year history, but it’s best known for its cars and has been the world’s largest manufacturer of internal combustion engines since 1969. Honda’s reliable, high-quality and high-performing engines have earned the Japanese manufacturer global status as one of the most trusted car and engine manufacturers. To find used Honda engines in your area, fill out the lead form above and ASAP Motors will provide you with quotes from reliable auto parts brokers in just minutes. 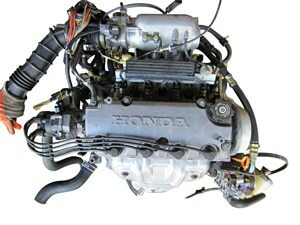 Finding reliable used Honda engines for sale is not as simple as you might think. There are plenty of companies that carry used motors, but locating the right one can be tough. Make sure when shopping for a replacement Honda motor, that you ask a lot of questions. At ASAP motors, we can help you find used Honda motors from salvage yards, recyclers, and engine brokers at great prices. Sometimes, different companies may advertise different engines for sale at deeply discounted prices, like the Honda Accord’s for example. This used Honda engine will also conveniently fit the early versions of the Honda CRX without any major need for modification. When it comes to searching inventory, things can get overwhelming when it comes to Honda parts. A motor that Honda uses in a specific car can vary drastically from the one used in the next vehicle. As an automaker, Honda has so many different models like the Honda Accord, CR-V, Passport, and the Prelude just to name a few. The good news is, used Honda engines in good condition are easy to find once you know what you need. Once you have determined the correct model & year of your car, you are on the right path to finding a high-quality used engine or transmission for your Honda vehicle. Just select the year and make of your Honda vehicle from the drop-down menu above. That will send you to our engine locator form. Fill in the required boxes with the correct information and you will be all set. If you want to receive information by phone, please include your phone number. Last, just click on the “get me a price” button and the website will do all the work for you. Review the information and offers that come in carefully. Make sure you ask plenty of questions including warranty, shipping, and price. Remember, the suppliers are competing for your business so make sure you do shop around. Make your final choice and ask for the engine to be shipped directly to the installer instead of your home. Always make sure they accept credit cards and PayPal so you will be protected in case an issue arises. Happy Motoring! With a selection of vehicles ranging from practical sedans and powerful trucks to hybrids and electric cars, there’s a Honda for everyone. Select your Honda engine model below. Used Honda Accord engines can be found using our engine search tool. Get a used replacement engine fast for your Honda Accord. The CR-Z is the answer to a sporty hybrid. It is only available in a coupe and is a 2+2 seating car that comes standard with a manual transmission…. Honda’s legacy began before World War II, but it wasn’t until the 1960s that their first production automobile was released. In the decades since, it has set itself apart from other auto manufacturers with its consistent dedication to innovation and quality. Today, Americans know Honda cars and engines for their exceptional reliability and generally affordable prices. That signature reliability makes Honda engines a popular choice with commuters and racecar drivers alike. How do I check Honda engine codes? On some vehicles, it can be difficult to quickly find the engine code. Luckily, Honda makes it easy. Simply open up the hood of your car, look into the engine bay and locate the code stamped on top of the engine block. What type of oil should I use in a Honda engine? According to the official Honda owners site, it’s always best to use Honda Genuine oil. If Honda Genuine oil is not available, be sure to choose an oil which bears the “Starburst” certification symbol. That symbol indicates that the oil in question has met the standards of the American Petroleum Institute. For more specific recommendations, read your Honda’s owners manual. Inside, it will tell you what weight grade you should look for. How do I swap a Honda engine? We generally recommend that you see a professional mechanic to have your current engine swapped out for a used Honda engine. However, it’s possible to do it yourself as long as you’re equipped with the right tools. To prepare for the process, be sure to visit a local auto parts store or consult a mechanic to ensure that you have everything you’ll need. Here are three of the most popular used Honda engines for sale. The CR-V is a compact crossover SUV that Honda has been manufacturing since the 1990s. True to its name (which stands for Comfortable Runabout Vehicle), the CR-V has garnered a reputation as an ideal vehicle for families. All Honda CR-V models are powered by inline-four (I4) engines, which are known for their compact size and good power-to-weight ratio. The Honda Civic has been in production since the early 1970s, and today is one of the most popular cars in the world. Beloved for everything from commuting to racing, the Honda Civic is similar to the CR-V in that it’s equipped with an I4 engine. The Accord is a mid-size vehicle that’s received high ratings across the board. With its exceptional gas mileage, comfortable ride and excellent handling, the Accord is nothing if not a crowd-pleaser. The 2018 Accord is can be powered by two engines, both of which are turbocharged four-cylinder engines with varying levels of horsepower.